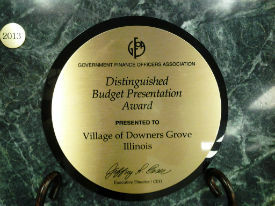 The Village of Downers Grove has received the Government Finance Officers Association (GFOA) Distinguished Budget Presentation award for the 2013 Municipal Budget document. This is the fourth consecutive year that Village Finance Director Judy Buttny and staff have been honored with this significant achievement, which reflects the commitment to meeting the highest principles of governmental budgeting. The 2013 Municipal Budget satisfied nationally recognized guidelines for effective budget presentations. The guidelines are designed to assess how well an entity's budget serves as a policy document, a financial plan, an operations guide and a communications device. The Village's budget was rated proficient in all four of these categories. The GFOA is a non-profit professional organization with over 17,000 members throughout North America. The award program encourages and assists state and local governments to prepare budget documents of the very highest quality that reflect both the guidelines established by the National Advisory Council on State and Local Budgeting and the GFOA's recommended practices on budgeting. Reports are evaluated and reviewed by members of the GFOA professional staff and by outside reviewers with experience in public-sector budgeting. Budget documents must be rated proficient in 14 mandatory criteria to receive the award. For more information, contact Communications Director Douglas Kozlowski at (630) 434-5550.